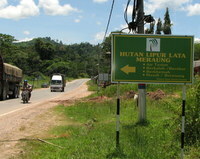 To reach Lata Meraung, you take route 64 from Jerantut, heading West. 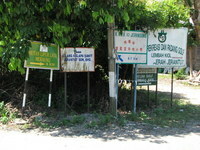 After a few km there is a turnoff to the left. 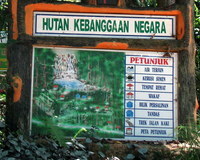 Follow this road, it passes an Orang Asli village. Follow the signs to the Golf Club. 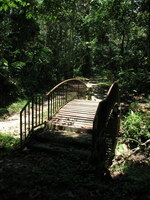 Just before you reach the Golf course, there is a trail to the right with a bridge, which probably also leads to the fall. You can also proceed a bit further,just beyond the golf club, where you will find unmarked steps uphill. 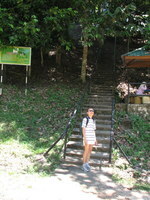 It is only after you have climbed the steps, that you will see the signboard for the waterfall. A clear trail will lead you in a few hundred meters to the fall. 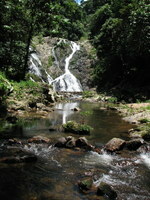 The waterfall is not big, but very scenic, because the water flows down the rocks in several streams. THere is a nice pool, perfect for swimming and bathing.